Rooftops in New York are the city equivalent to the welcoming allure of a country porch in southern states. Since we share our city with over 8 million other people that most likely don’t have a backyard either.. New Yorkers often take to the sky in search of some R&R. Rooftop spaces are utilized for everything from urban gardens to spa retreats and even movie showings (Brooklyn’s Industry City offers Rooftop films in the summer). 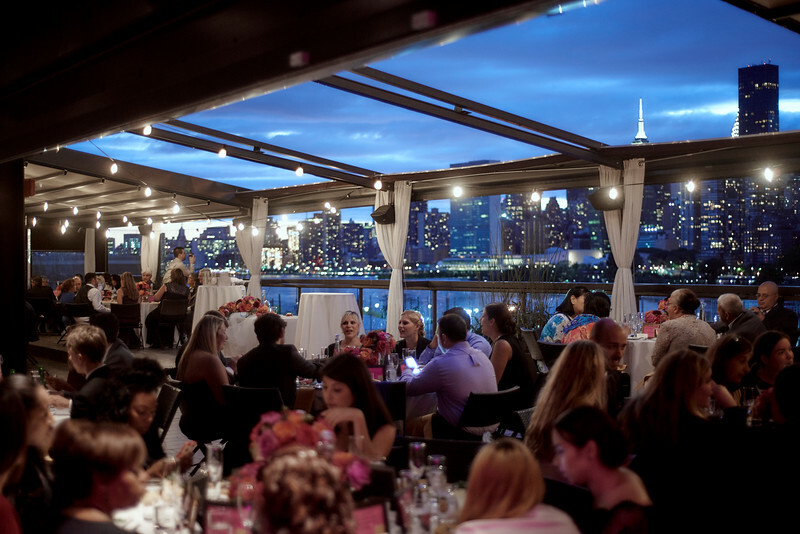 So it’s no wonder that many New York couples choose a rooftop venue for their wedding day. The city offers a variety of choices from small intimate terraces to spectacular lofts with swimming pools and views of St Patricks Cathedral ! 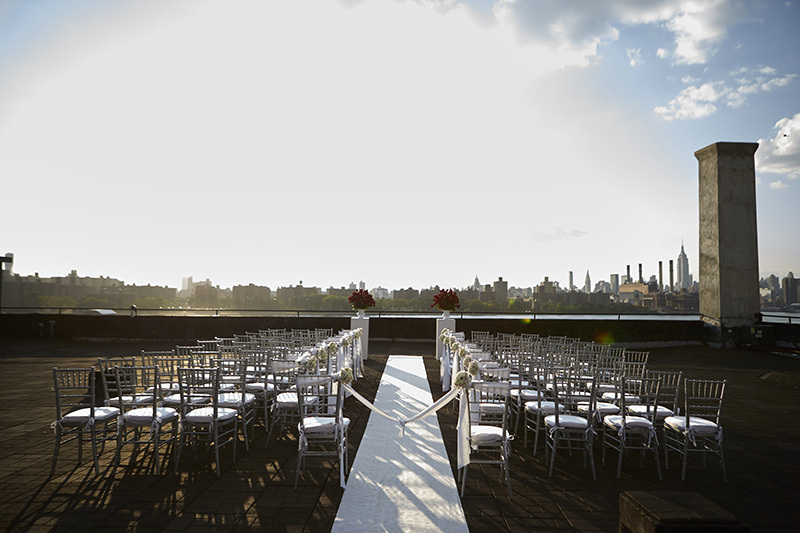 No matter your preference, NYC has the perfect option for your rooftop wedding. Below are a few of our photographer and videographers top picks for venues throughout the boroughs that offer outdoor rooftop space, amazing views and top of the notch service! 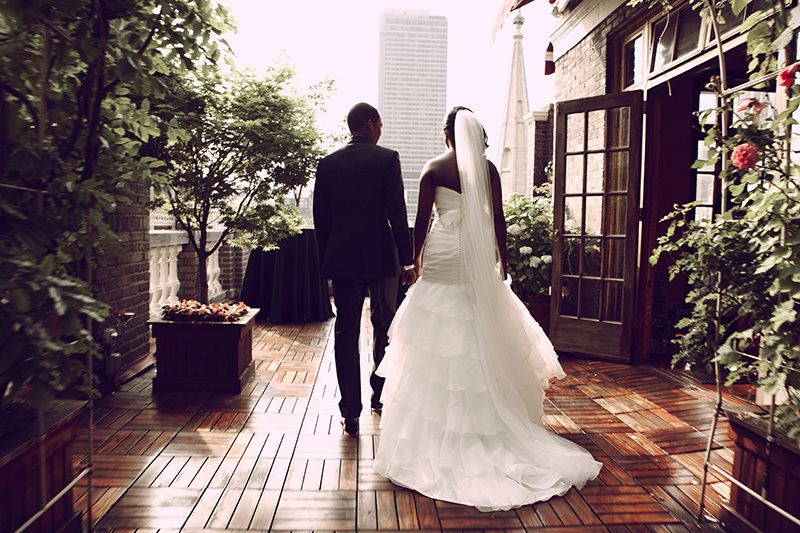 If you prefer a Manhattan address for your big day, then Midtown Loft & Terrace may be the perfect choice for your rooftop wedding. An upscale venue in the heart of midtown, couples can choose from two unique spaces (or utlize both) for their wedding celebration. Our photographers love the amazing backdrop provided by the Manhattan skyline here and the photographs are always breathtaking! Added bonus: The terrace can be enclosed with a retractable roof in case of rain or in the winter months so you can host your rooftop wedding year round! Brooklyn has become a great contender for the Manhattan based wedding venues. 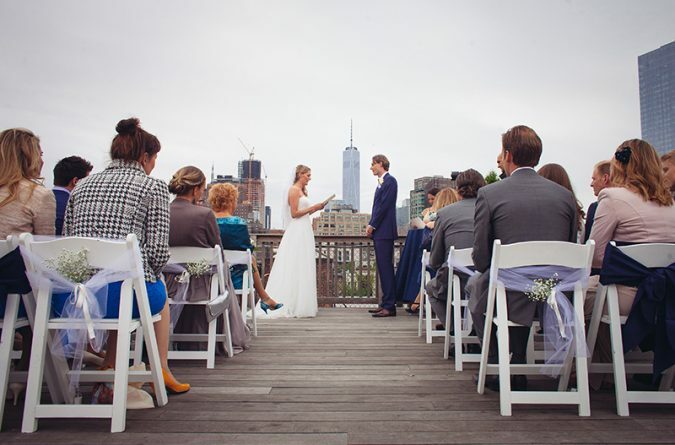 Not only does the hip borough offer raw industrial spaces for your wedding day but couples looking for a dramatic backdrop for their outdoor ceremony couples can not choose from several rooftop venues in the borough! The W Loft is one of our favorites and offers couples indoor and outdoor space that can be customized based on their taste. Located in the Williamsburg section of Brooklyn, our photographers are only a few stops away from the convenient location. Added Bonus: The indoor space features floor to ceiling windows giving you and your guests access to views of the Manhattan skyline even after your rooftop ceremony is over! Long Island City is getting in on the action and offers several rooftop venues that are within 10 minutes of the popular Gantry Plaza State Park. A popular engagement shoot location, the park offers unobstructed views of the Manhattan skyline! Penthouse 808 at the The Ravel Hotel is the boroughs’ only glass enclosed retractable rooftop venue and hosts weddings year round. The rooftop overlooks the East River and Roosevelt Island and at night the Queensboro bridge lights up and offers even more drama for your photography! Added Bonus: The rooftop venue is at the top of Ravel Hotel so you and your new spouse don’t have to go far to get some rest after dancing the night away!